If you are in the process of planning your special day, and would like to make ethical choices that benefit animals, it’s easy to include us in your big day! In lieu of presents, ask friends, family and relatives to make a donation to Animal Defenders International. As an alternative, they can simply make a donation at your reception. 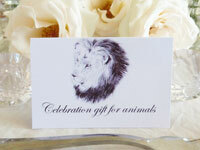 Instead of giving your guests traditional wedding favours, you can give a donation to Animal Defenders International, and we can send you beautiful table wedding favours to inform your guests of what you have chosen to do. Wedding favours are a traditional way of giving guests token gifts on your big day. As an alternative to sweets and other small gifts, why not make a donation to ADI to support our rescued animals on behalf of each guest. The suggested minimum amount for each wedding favour is £1 or $1 per guest. Thank you for sharing your wedding celebrations with ADI and congratulations from us all!